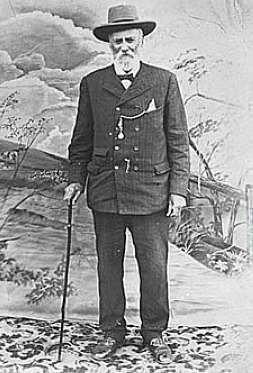 Tom Petrie (1831-1910) was the third son of Andrew Petrie who had been appointed on 28 August 1837 as the first civilian public servant, the Superintendent of Government Works, at the Moreton Bay convict settlement. Andrew and his descendants were to make an enormous impact upon the history of the Pine Rivers Shire. Andrew made a number of private journeys through the Pine Rivers area and he was the first European to climb Mount Beerwah, one of the Glasshouse Mountains. He was also the first person to bring back samples of the Bunya Pine. As a young child, Tom was allowed to mix freely with Aboriginal children. Accepted by the Aborigines as a friend, he was encouraged to share in all their activities and he learnt to speak the Turrbal Aboriginal language. During journeys with his father, he also gained knowledge of bushcraft and surveying and so became indispensable as a messenger or companion to early exploration parties. After several years on the New South Wales and Victorian goldfields, Tom returned to Brisbane, married Elizabeth Campbell in 1858, and, with the help of Aboriginal friends, inspected the North Pine area and negotiated with Mrs. Jane Griffin, the widow of Captain George Griffin, to purchase the lease of ten square miles of the Redbank section of the Whiteside run in 1859. The property, which he called Murrumba (meaning 'good' in the local Aboriginal dialect), extended from Sideling Creek in the west to Redcliffe in the east. As Mrs. Griffin had raised money by mortgaging Redbank, technically she was unable to make an agreement with Petrie who subsequently found himself left without clear title. From 1862, in response to changing land laws and in order to protect his investments, he was obliged to purchase some of the land. In so doing, he became one of the first freehold landholders north of the North Pine River. By 1864, the Murrumba homestead had been built on the eastern side of Petrie Hill (on land now owned by the Roman Catholic Church) replacing early temporary structures used by the family. Although increasing closer settlement reduced the extent of the Murrumba property, by 1888 the Petries still held 3,000 acres which were closely fenced and well stocked for horse and cattle raising. By this time, Murrumba had become an important centre for the local community. Tom was a foundation member of both the Caboolture and Redcliffe Divisional Boards and he continued to play a significant role in local affairs until his death at Murrumba on 26 August 1910. The following year, the Department of Railways changed the name of the North Pine Station to Petrie and a stone memorial was unveiled in his honour. His epitaph, engraved on the stone obelisk, reads "Pioneer, Patriot, Philanthropist". As well as Petrie and Petrie Street, the name of the locality of Murrumba Downs celebrates Tom Petrie's achievements.